The club was formed in 1903 and played in local leagues for the vast majority of their early history. They joined the Essex Olympian / Intermediate League in 1978, winning the title ten years later. Fortunes soon dipped however and in 1992 they were relegated to the second tier after gaining just 8 points all season. They soon recovered, however, winning promotion back up a couple of years later. 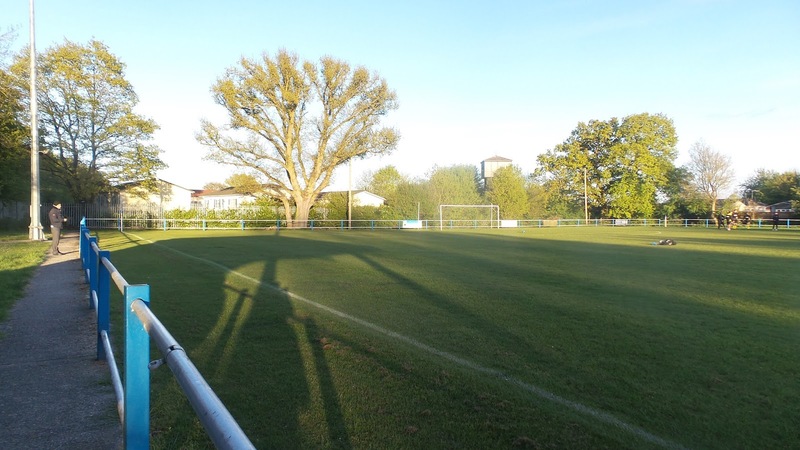 They were runners-up in the Premier Division in 2008, finishing behind White Ensign, which was enough to see them accepted into the Essex Senior League. They've been there ever since, with their best ever finish of 3rd being achieved three times. This season, they will fall slightly short of matching that, but it's still a massive improvement from last seasons 18th place finish. 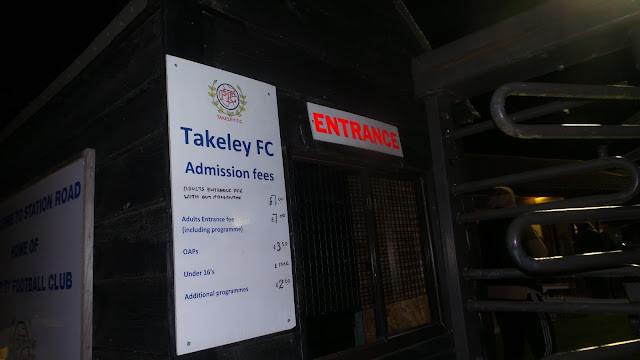 Takeley have enjoyed seven FA Cup campaigns, but have just one victory, this coming when they beat Newmarket Town in 2012 before losing to Grays Athletic in the Preliminary Round. The same season also saw their best ever FA Vase progress when they reached the 2nd Round before losing to Hertford Town, a feat that they repeated the following season, with the victors this time being Brightlingsea Regent.Locally, they won the Essex Premier Cup in 2007, beating Ongar Town 1-0 in a final played at Thurrock FC's Ship Lane Ground. With the end of the season approaching, choices of games were getting more and more limited, with many leagues bringing the curtain down on their seasons. Thankfully, most of the ones packing up were more southern based ones and with Anwar available on a Tuesday for the first time in a while, that wasn't too bad a thing. I presented him with a list of games at the Wycombe game on Saturday and we both agreed that Takeley, being the closest option, would probably be the best choice. Amazingly, against the league leaders Doncaster Rovers, we played well and came away with a 2-1 win, a total contrast to the drab defeat to Mansfield the previous week. It was about the only good news in a pit of despair for me personally. Work continued to be a trial, and the first quote that I'd got to repair the damage a kamikaze fox had done to my car last week was nearly £1200. I've got the option of searching elsewhere or part exchanging 'as is' but I'm still going to have to take a big financial hit through bad luck and no fault of my own. On the day of the game I did my usual walk down town on my day off. The afternoon was pretty productive, with me listing a good chunk of the stuff I wanted to sell on eBay. It's one of those jobs that I've been putting off for ages, thinking that I'll leave it until the end of the season. Though it's unlikely that I will make much off of it, it felt good to get it up and have a tidy up in the process. This took me 3 hours to do, and although I've still got a fair amount to list, it was good being able to listen to the Jon Holmes show on TalkRADIO whilst doing it. After getting my things together and making up a flask, I left just before 4.30, meeting Anwar in Aylesbury at 5. We made decent time with just a 15-minute delay on the M25 due to a crash, but for once it was pretty well dealt with. 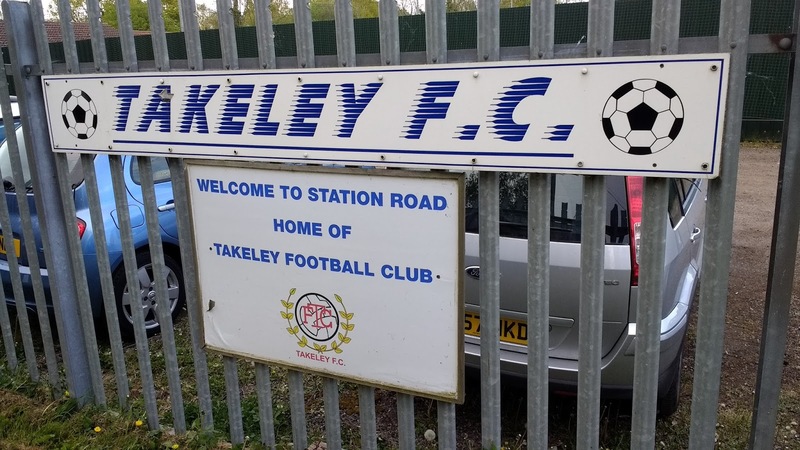 We got to Takeley at 6.30 and after having saveloy and chips plus a samosa from the shop next door. 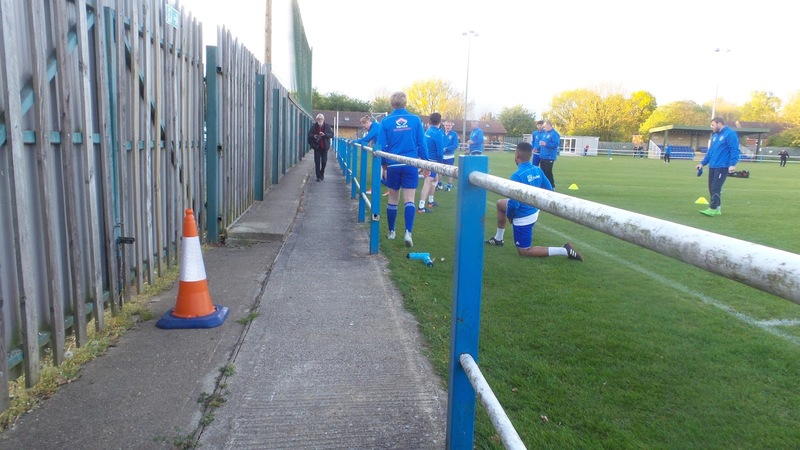 We then went into the ground and met up with Dan and Maurice, some Braintree fans that we know. We had a good chat while we waited for the game to start, seeing some other hoppers that had come along for the game. It was an unseasonably chilly evening with temperatures more suited to winter. 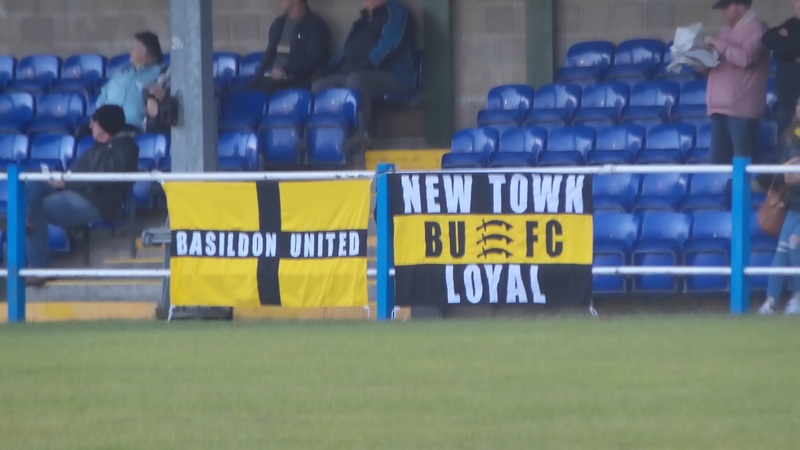 Basildon had bought some good vocal support and some flags but it was Takeley that had the best of a goalless first half. 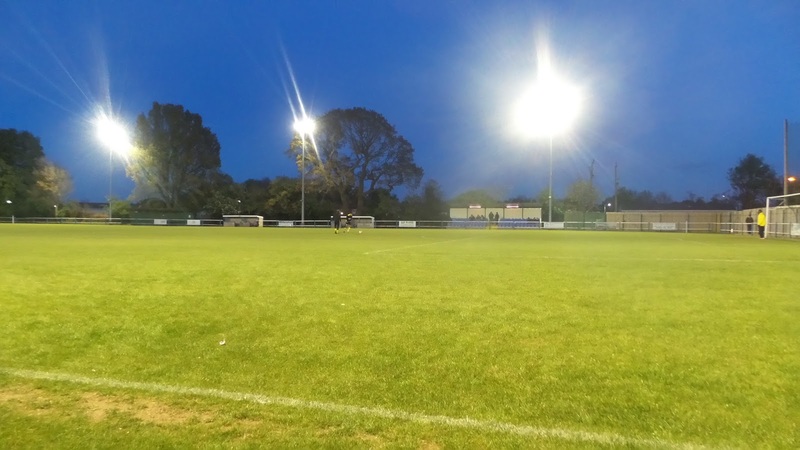 It started openly enough, with some good chances in the first 20 minutes but then it descended into a game of misplaced passes, mistimed tackles and wayward free kicks. Basildon came back into it in the second period but it was not until the last ten minutes that the game started to liven up. 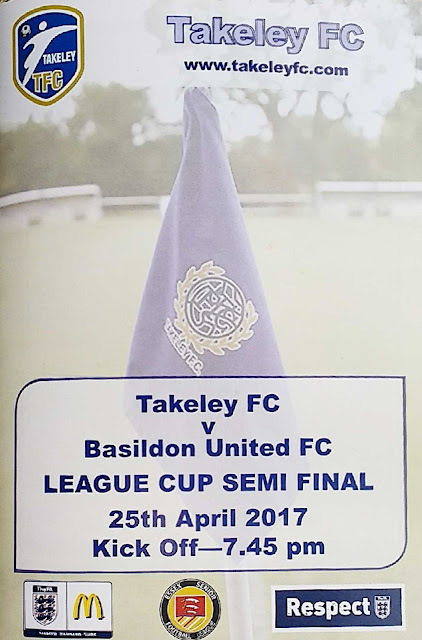 Takeley had the best chance of the game when there was a clear sight on goal but Basildon keeper Leader made a great save with his feet. 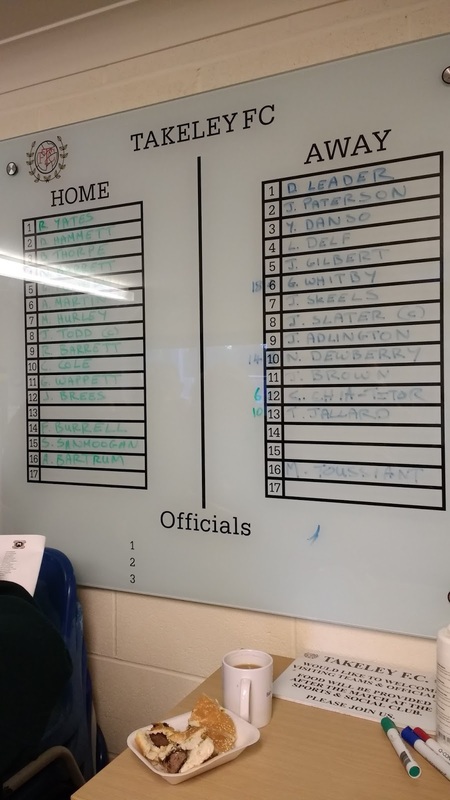 It certainly looked as if the Essex Senior League suffered from the lack of a step 6 feeder league. With very little threat of relegation, complacency sets in and the overall standard is pretty poor from what I've seen. I was, therefore, glad that I didn't have to endure extra time and that the game went straight to penalties. 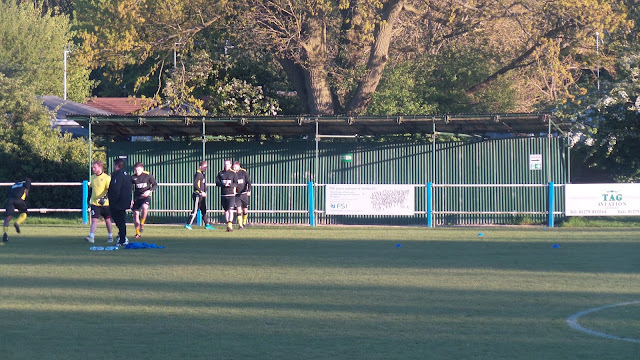 The first two penalties were saved - Basildon's via a great save from the Takeley keeper Yates to tip the ball over the bar, only for them to blast their own first effort off target. 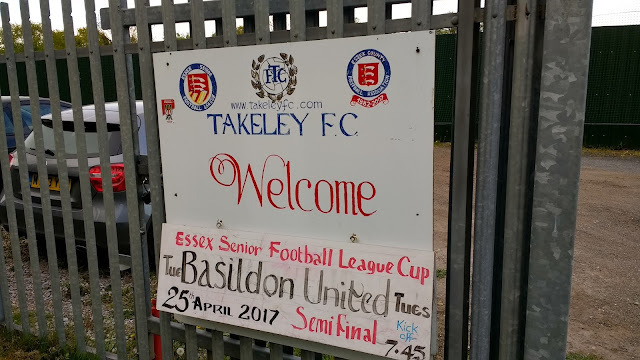 Penalties were then despatched with aplomb until Basildon's 4th was saved by the keeper to send Takeley into the final next Monday where they face Sawbridgeworth at Redbridge's Oakside Stadium. It was now 3 degrees outside and freezing. I said my goodbyes to Dan & Maurice and made my way back to the car. Myself & Anwar listened to the results coming in, although with a limited number of games there weren't any memorable outcomes. Leaving at 9.50, there were a couple of lane closures, but thankfully nothing major. I dropped Anwar off in Aylesbury at 11.05 as the temperatures got as low as zero degrees before getting home myself 20 minutes later. I got into bed pretty much straight away, going to sleep just after midnight. With me up at 4 am for work, I didn't get much sleep, though I felt OK in the morning. STATION ROAD is a well-appointed ground for step 5 football. 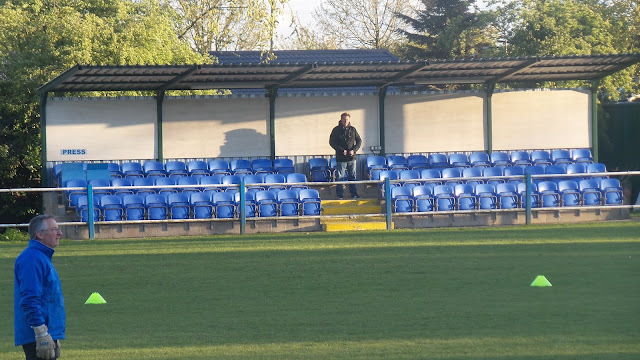 The main stand holds around 100 and has no pillars to impede your view and decent leg room. 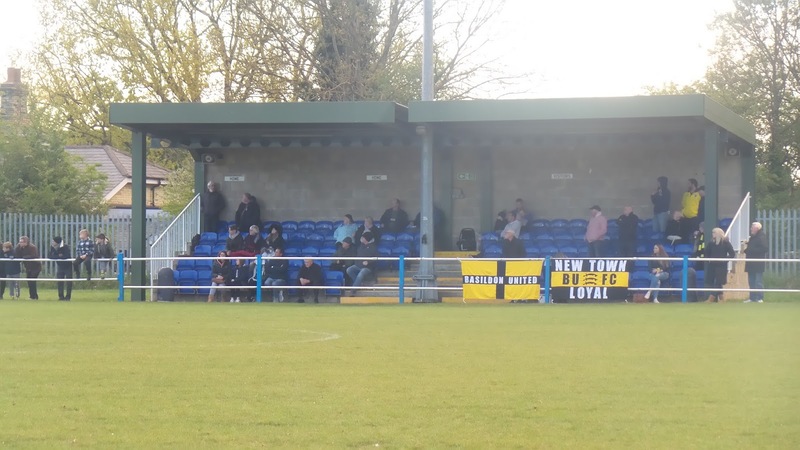 The same can be said of the smaller stand that holds just after 50 and there is also a further covered standing area holding around 100. 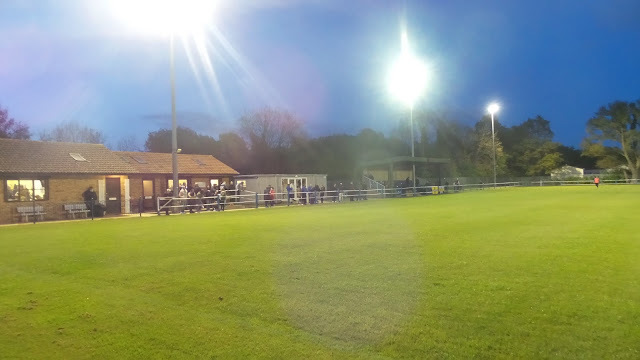 The rest of the ground is open, with a couple of steps of terracing behind one goal. There is no bar at the ground although there is a tea bar. Nearby is a chippy and an Indian as well as various shops.